"Congratulations! You have been selected to run Across The Years 2008.
tradition for many . . ."
This is becoming our New Year's tradition, too! Jim and I were very pleased to be notified a few weeks ago that our entries into the Across the Years (ATY) run near Phoenix were accepted. ATY is our primary goal race this year, so all the races leading up to it that I mentioned in the June 10 entry will basically be training runs for ATY (with the possible exception of Mountain Masochist, the only really hilly race on Jim's agenda). Mountain Masochist 50+-miler on November 1 (Jim). I included information about those courses and how we planned to train for them in the June 10 entry. 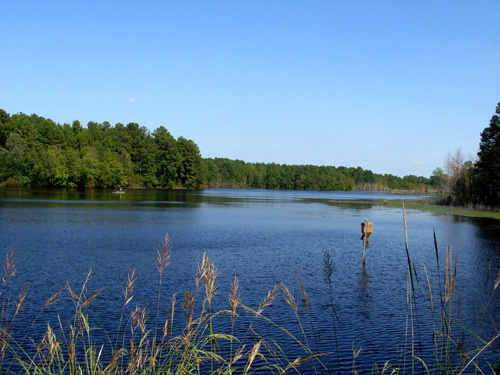 The main difference now is that our goal mileages for Hinson Lake have changed a bit. Jim still plans to be on the course for 24 hours (with a sleep break) but instead of aiming for 100 miles, he'll practice the pace and strategies he'll use at ATY and aim for a total of about 87 miles. I plan to run a steady pace for about six hours, then stop and crew for Jim and do some volunteering. I have some concerns about making the 7-hour cut-off at the NRT 50K two weeks later and don't want to trash my legs being on the Hinson Lake course too long. After the 50K I'll ramp up my mileage for ATY. Since we missed camping in Colorado so much this summer, we had tentative plans to head to the Southwest again this winter even if we didn't make it into ATY. We retired early so we could travel, by gosh! Once we knew we were in the race, it was more fun to firm up some of those plans and choose a couple more races in November and December to better prepare us for the rigors of ATY. Oh. Did I mention that Jim decided to do the 48-hour run at ATY instead of the 24-hour race???? No, I didn't think so. Some of our friends and relatives know, but I don't believe I've revealed that here to the entire world until now. If you remember from the entries I wrote in the 2007 journal, Across the Years has six different races going on over a 72-hour period of time: one 72-hour race that begins on Day 1; two 48-hour races, one beginning on Day 1, the other on Day 2; and three 24-hour races, one beginning each of the three days of the race. The 72-hour time period begins at 9 AM on December 29 and ends at 9 AM on New Year's Day (hence, "across the years"). When runners fill out the on-line entry form they must indicate their preference of races and days to run. Some people hedge their bets and rank all six choices to maximize their odds of getting into the race (more people apply than are chosen to run it). I ranked my choices of start days for only the three 24-hour races; with my Granny Knees, I don't need to push my luck going any longer than that. Jim ranked the two 48-hour starts first and second, then the three 24-hour starts. We each got our first choice: Jim will run the first 48-hour race on Days 1 and 2. I'll volunteer, crew, and dog-sit those days. I'll run my 24-hour race on the third and final day. It's OK if Jim's sleeping much of that time. I'll have everything I need on our table, from the aid station, or from our camper parked on-site again. I think running the last day will be even more exciting than running the second day like I did last year. I won't miss the New Year's Eve hoopla this time and I'll be able to see results from the first two races before I get out there to crank out my miles. After we knew we were accepted into ATY we made more definite plans for a fun-filled three-month trip to the Southwest from November to February. We plan to visit some different state parks in Texas to take further advantage of the parks pass we purchased last year, and we'll stay at one or two different military campgrounds. 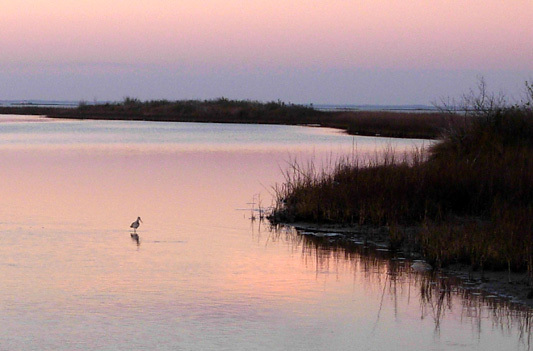 We really enjoyed San Antonio and Galveston, so we may return to those areas, too. We'll make some decisions about where to visit and camp while we're out there, depending on the weather, our recovery from ATY, and other factors (like our whims!). Wonder if we'll end up at Galveston Island again?? We had a great time in Arizona, New Mexico, and Texas last winter. After being at home for nine months, we're really looking forward to going back out on the road again in the camper. It'll be nice to have more running and travel adventures to write about in this journal, too! Sorry there's been such a dearth of that this year. This will be our first time at this race, which consists of 6-, 12-, 24-, and 48-hour runs AND bike races, as well as a Centurian walk (100 miles in 24 hours). Whew! That's a lot of people and times for race management to keep up with. We've heard some negative comments about the condition of the previous course and have high hopes for this new venue. 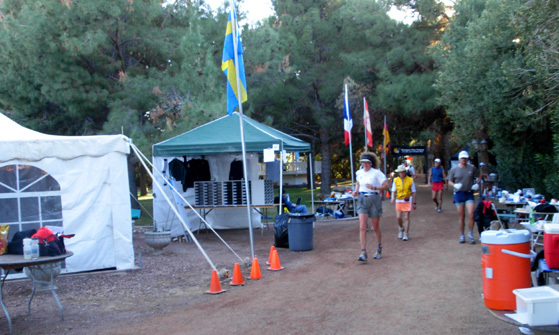 The runners and cyclists use separate short-loop courses, which is A Good Thing. I believe the run course is about a mile loop. The web site hasn't been completely updated with new information yet, so we aren't sure about some aspects of the race. I'm entered in the 12-hour run. My plan is to get in 50-55 miles in 12 hours, which is my goal for the first half of ATY. I'm more concerned with time on my feet than distance, however. Because of my deteriorating knees, I have to be judicious with the miles I run in training and "training races." Jim's in the 24-hour race at Ultracentric. His plan at both Hinson Lake and Ultracentric is to simulate his first day in the ATY 48-hour race: aim for a total of about 87 miles and sleep a couple hours during the night when he first feels really sleepy. He's gotten sage advice from other 48-hour runners who regretted setting a certain time or distance before they took their first nap and then couldn't sleep soundly because they were TOO tired. He'll also get to practice the joy of waking up with cold muscles and getting moving again on the course at or before sunrise! Course map from the Ultracentric website. 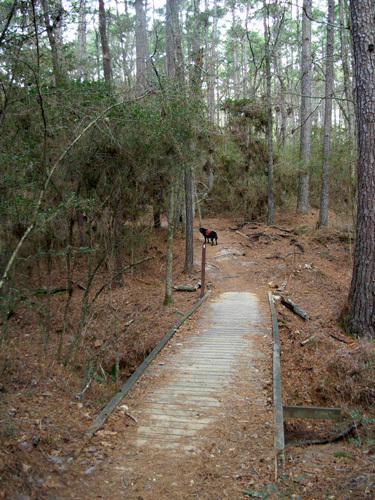 Red loop is for runners/walkers, green loop for mountain bikers. [Funny aside: We've been making camping plans for most of the races on our Southwest trip. Sometimes we make a last-minute decision where to stay, but it's nice to have more solid plans before a race, especially one we haven't run before. Since there isn't room to park our camper at the race venue for Ultracentric (Erwin Park), we contacted a couple of private campgrounds in the area. The campground that sounds the best for us won't take reservations until about two weeks prior to the date we want to stay there. That's very unusual in our experience, so in a phone conversation I asked the lady why. "Because we don't know which sites will be available then." Huh? Why not? "Because we don't make reservations in advance." 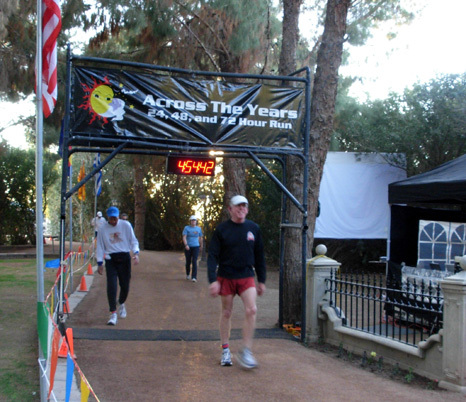 These races are held in the same nice park where we stayed a week in February for the Rocky Raccoon 50/100-mile races. Both of us ran the Sunmart 50-miler ten years ago and Jim's also done the 50K. The trails are a bit rougher and they undulate more than the course at ATY but it will still be a good "last long run" before ATY three-plus weeks later. There isn't a limit on registration so we haven't entered the race yet. I plan to run the 50K. Jim hasn't decided if he's going to do 31 or 50 miles there. We want a good, solid run without trashing ourselves for ATY. Our plans after ATY are more nebulous. We may remain in the Phoenix area for the first week or two in January. It'll be a nice place to recover from our hard effort at Across the Years. I'd like to return to McDowell Mountain Park east of the metro area. 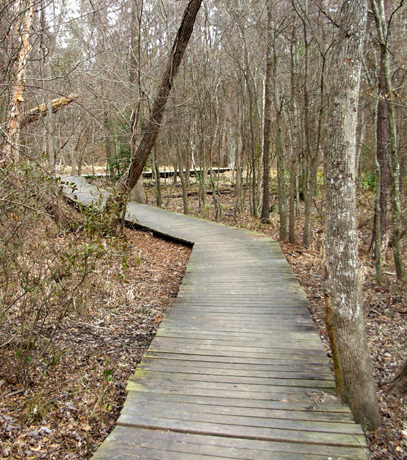 There are so many nice trails there to run and bike. You can check them out in the early January, 2008 entries in this journal. As much as I'd love to add a new state to my "50 States and DC" list of marathons and ultras, I don't plan to enter Ghost Town because of the mountainous terrain. Jim signed up this week since the race has almost reached its entry limit. He does have some concerns about whether he'll feel like running and walking on the rugged course only two weeks after his 48-hour run but he'll do as much of the course as he can. With a 12-hour time limit at Ghost Town, it appears that despite some rough, hilly terrain and the moderately high 5,000-7,000-foot altitude, runners can do a fair amount of walking and still git 'er done. During the race I'll help RD Susan prepare the post-race meal and work the finish area. She and her husband Matt have graciously welcomed us to camp on their property on race weekend. I've enjoyed Susan's posts to the ultra list the last couple years and am looking forward to getting to know her better. 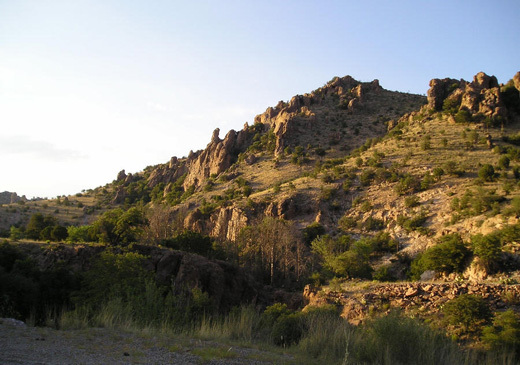 We can't predict at this point where we'll go after Ghost Town, but I'm sure we can find some place warm and scenic to visit in southern Texas! Possibilities are Big Bend NP and/or somewhere else that's new to us along the Texas coast, like Padre Island NP or Mustang Island State Park if they aren't damaged too seriously during hurricane season (Ike's currently headed that way). 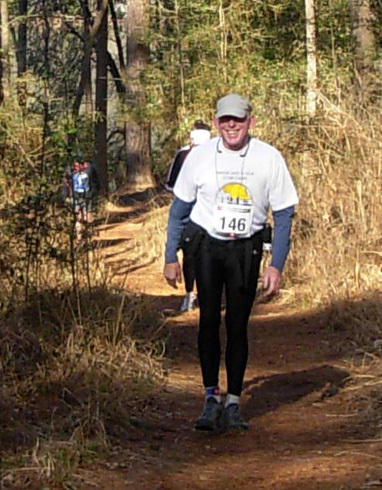 Jim is also considering signing up for the Rocky Raccoon 50- or 100-miler at Huntsville State Park (above) again because it's a nice course and we'll probably still be in Texas in early February. He still has time to think about that one. I doubt I'll run it. I need to save my knees for some races after I turn sixty at the end of March . . .
We're excited about our three "local" races coming up in a few weeks. We've missed seeing our ultra friends all summer! We'll see even more of them -- and make new friends -- in the races we're doing in Arizona, Texas, and New Mexico this winter. We love the training and racing and traveling, but it's the people who are involved in the sport that make ultra running really special.